Time is passing by so fast. It’s hard to believe that December is almost half over and I just went to my second holiday party of the season. The gods of Michigan Snow are being kind to little old me who has lost her stomach for driving in Winter Wonderlands. The temperatures are bone-chilling cold, the landscape is covered with snow but the roads are down to bare asphalt. The worst place I have to drive is on my own driveway that, for reasons I can’t explain, is the only one on the entire cul-de-sac that is still snow covered. Not a lot of snow, just enough to make going to the mailbox akin to standing at the top of a ski slope wondering if you’ll make it to the bottom without falling. I put on my boots with ice fishing cleats attached and I use my husband’s old, four-footed cane for the trek. I also go to the mailbox in the late afternoon when people are coming home from work. In case I do fall, I figure I won’t have to lay there long before someone would drive by and take pity on me. My momma didn’t raise any fools. My second Christmas party of the season took place out in the boondocks which means the weather often prevents me from going but this year when twenty of my Red Hat Society sisters gathered at an upscale restaurant to order off the menu, I was one of them. This group, without exception, always orders dessert at parties so it gets pricey. I could not believe they have desserts listed for as high as $9.50. Still, we all went home with a box with half our entrées inside and the taste of brownie, hot fudge sundaes or crème brulee on our lips. We do a $10 gift exchange that are distributed using the Right/Left game so you don’t know who will end up with what you bring. Two other groups I belong to have the bring-only-consumable-goods gift rule and I’ve suggested that rule to the Red Hatters. We’re all in our 70s and 80s and who needs more jewelry, scarves, candles or décor do-dads, but the suggestion falls on deaf ears. This group likes bling. 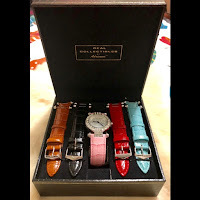 Wouldn’t you know it, the gift I got at the party was a watch with exchangeable bands that I’ll never wear. “You spent more than $10 on this,” I said as I thanked the woman who bought it. 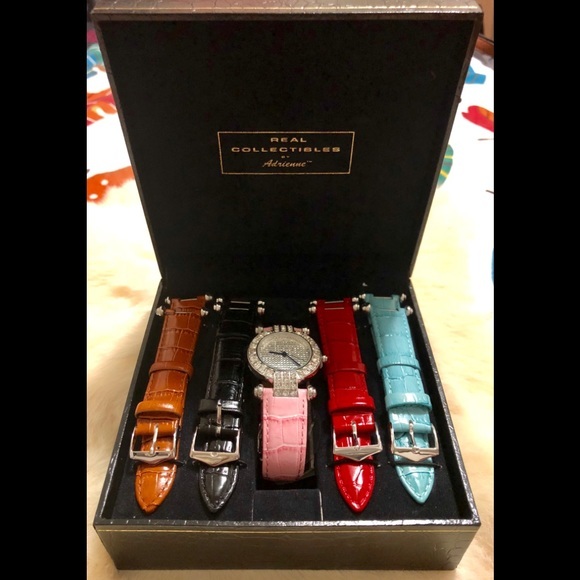 She smiled and said, “I just buy what I like and I don’t care about the price.” I spent July e-Baying collectible watches out of the house and I’d re-gift this one if I could, but I can’t think of anyone who'd wear it. Google priced it at $25. For a fleeting moment it made me feel cheap for only spending $11 on my $10 exchange gift. I’m thinking of wrapping the watch back up and leaving somewhere for a stranger to find. Well, except I couldn't leave it at an airport, school, mall or theater where someone would call the bomb squad about a ticking box. Even with consumable gifts you don’t always welcome the gift you get. Last year a diabetic got a box of chocolates in an exchange and at my Gathering Girls party I went to recently I gave an assortment of teas along with a King Arthur gingerbread cake and cookie mix arranged in a cute snowman box and the next day I got a text asking me if I had the original tea boxes and receipts. Unfortunately, the recipient doesn’t drink tea. At that party we used the stealing game to distribute gifts but our game ended before she got a chance to ‘steal’ a gift she liked better than the one she opened. Oh, well, her family does a gag gifts exchange---things like toilet bowl brushes---so hopefully, she can re-gift the tea. If not, Goodwill probably benefits after the holidays from a lot of gifts that missed their marks. Even Donald Trump Jr. was joking on TV recently that his father re-gifts to him a lot of monogrammed gifts that are given to the president. I think lots of people just like opening presents, and that's why these awkward gift exchanges keep on, even though they're basically a waste. I think you're right. There is a minute of thrill that is probably reminiscent of how we felt as children opening gifts from Santa. Good Saturday mg Jean. You're lucky asked to parties. Since I retired, I've never been asked to nothing. I hated when we went to these parties asking to like $10 or $20 and some people abide to it while others went overboard. One teacher party I went to and we told to no more then $25, so I did. The person who had my name spent $100 and to this day I feel cheap because I only gave her $ 25. Why do these people do these things? As for as Trump, I hope they give him all that he deserves and his family except for Baron. Well my friend, enjoy your day and I hope you haven't finished eating all of those goodies. Send one to me please LOL See ya. Wow, from $25 to $100! That's just not right and it's not right that it makes the rule followers feel bad but that's what happens, doesn't it. I am so over gift exchanges! My oldest friend and I also have December BDs. She recently lost her job and I didn't want her thinking the usual gift-giving was necessary, plus we both agreed we really sort of hate it. So this year -- no gifts to each other. Our couples group decided to make a donation to Heifer International instead of exchange gifts, which feels great! Only two other friends and I still exchange gifts, but they are modest and fun and I can handle that. In our immediate family, even though small , we've taken to drawing names so there's only one gift to buy, but we do all get gifts for the little granddaughters. I like the scaling back....I just donated a gift exchange gilt I got last year to a local thrift store. Yes, they do probably make out great after Christmas. As for the Mueller gifts.....keep 'em coming!!!!!! I've always wanted to do the Heifer International donation but never have. It seems like such a good investment/gift. My family this year is just giving gifts to the little kids and my two nieces are buying all 12 of them their gifts. Not sure how that came about but they are in charge of the parties now so. Every generation gets to put their mark on family traditions and it's their turn. My knitting group does the "Chinese fire drill" fifteen dollar limit thing and there are generally gifts that everyone wants. Last year I stole a hand sewn totebag with a skein of yarn, lol. This year I took and did not steal and I got handmade Christmas pillow cases and those round napkins that are folded like trees. We also do little things, like one gal painted small snowman rocks and such. My other group really doesnt do anything! The Chinese fire drill game is the same one I called the stealing game that we played where my friend got the teas she didn't like. The problem we had playing it, no one wanted to steal another gift so basically we just opened a present by number. $15 would be easier than $10, especially in a club that makes things. One year in our family we had a rule where you had to make or write something with a ridiculously low limit like $2. It was the most fun Christmas because we got some really nice letters and poems. I just can't imagine calling someone for the receipts so they can return in! Really? I think I would have just regifted. Or donated. It just seems a little rude to me. I like the stealing one if I'm towards the end!! I'm really glad she texted the request instead of called because I was a little shocked by her asking. The King Author gingerbread and cookie mix was $6.00 so we're not taking about a big investment in the teas even though I did spend a little more than the limit. I don't belong to any groups that do gift exchange, and I would find it hard to choose a gift for an unknown recipient. For me, the joy of gift-giving is trying to find just the right gift for someone I care about. Except for the gift calendars that I create each year from garden photos, my favorite gifts to give are books. Last week, I spent a couple of hours in my favorite independent bookstore, just browsing and picking up books for various people on my list. I enjoy getting books as gifts, too. Sometimes I'll get one that doesn't interest me, but I always hold onto them and then, several years later, I'll take it off the shelf and become completely engrossed. Anyone in a group you're in would love your calendars. It is hard to buy for an unknown person. I don't enjoy doing it.